Nam Tok translated literally is "water fall" but actually means dripping juice. The juice drips out from the steak while cooking. 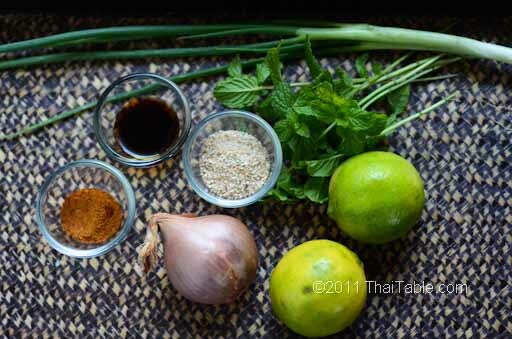 Nam tok is fast and easy to make, the ingredients are easy to find and yet, the dish is full of Thai flavors. 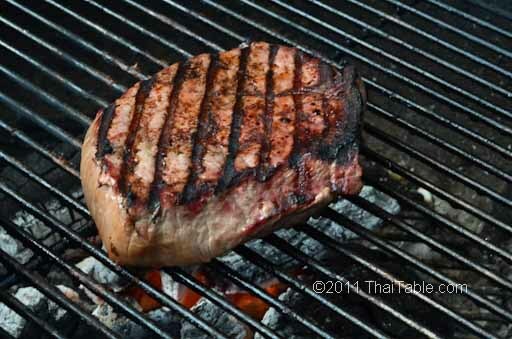 At its core, you're grilling meat without marinade, then cutting, seasoning and tossing a salad. 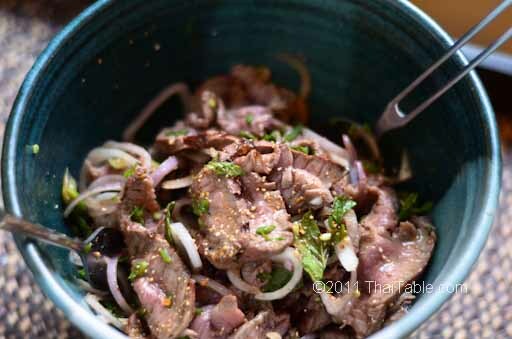 If you have a leftover steak that is not heavily seasoned, you can turn it into nam tok, too. Nam tok, a northeastern dish, is served with sticky rice and fresh vegetables. 2-minute Toasted RiceToast rice (regular or sticky) in a pan over medium heat. Move the rice around constantly to prevent burning and achieve even browning. The rice should be dark brown (not burnt) in about 2 minutes. Grind the rice in mortar. Toasted rice not only provides the nutty flavor, but also rounds the fish sauce and lime juice in. I use 1 inch thick London broil for this dish. Leave the steak at room temperature 1 hour prior to cooking for even cooking. The charcoal should be hot with small flames and lightly covered with ash. Without covering the lid, grill the steak for 10-12 minutes, 6 minutes on one side and 4 more minutes on the other side for medium rare. Add 2 more minutes on each side for well done. I like mine medium rare. Let the steak sit on a plate while you prep the vegetables and seasoning. Peel and slice shallot thinly. Slice green onion and mint leaves. Slice the steak into thin slices so that the beef is tender and absorbs seasoning well. 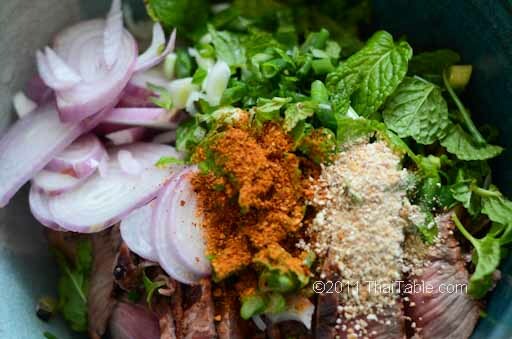 Add lime juice, shallot, green onion, mint leaves, ground chili pepper, ground toasted rice and fish sauce to the steak. Mix well. Take a taste. 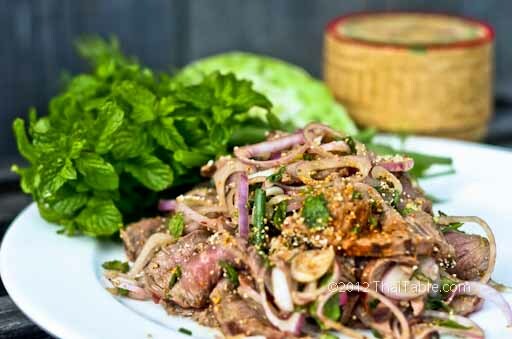 The beef should be balanced by salty and sour, with the nutty flavor of toasted rice and refreshing mint flavor on every bite. Ground chili pepper at 2 teaspoons is about a comfortable level of heat for me. If you love really hot food, you might want to add more chili pepper. Serve with sticky rice and fresh vegetables. 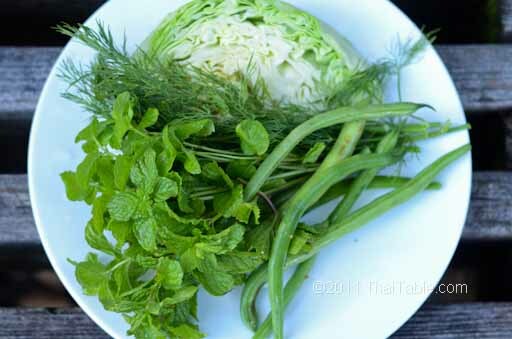 Popular vegetables accompanying nam tohk are cabbage, green beans, dill leaves, mint, Thai basil and cucumber.